sadie + stella: What I am Loving..
You know I love a good "What I am Loving," as I am always loving a myriad of things. Shop.A.Holic. I know we are all coming down from the "Holiday High" (my new coined phrase) and are knee deep into our resolutions. While some of you chose being more healthy or spending less, I chose neither. I don't need a new year to kick start my behavior. Therefore, I still have a long lust list of things I may or may not need. Also, let's face it, I always do my part as an American citizen to boost the economy. Uncle Sam, you are welcome. 1. Tell me these umbrellas are not the absolute most. Just try. You can get them in a variety of dog breeds, but this one so happens to salute my mini schnauz, Billie. 2. I am always on the lookout for tapers that are unique and not your average run of the mill everyday cream. Enter the fabulous striped taper. These are just too good to burn. Just sayin'. 3. I love a zebra and I love me some personalized stationery. May Books has outdone themselves with their new zebra print motif. This comes in the stationery cards, as well as, their famous calendar/agenda. 4. This Persian runner is haunting me in my dreams. I cannot shake the vivid color scheme. I need it immediately if not sooner. 5. All of those books that you vowed to read in the new year are going to need support, no? How about these gilded pig bookends? I am a sucker for anything animal related, as we all are aware. 6. I have had my greedy eyes on this bracelet for ages. I mean for real. The color scheme is truly elegant, especially with the focal point emerald stones. Lawd. 7. The book of all books. Kate Spade: Things We Love. I love anything Kate Spade for MANY reasons. 1. I am a true Kansas City girl, through and through. So is Kate Spade. 2. And most importantly, she has the most incredible style. I swear. If she put a mangy single shoe out in stores with her name on it, I would more than likely buy it. I thought this was a safe place. Right? We are being honest. 8. These shams WILL make it into my bedroom. I am not quite sure how I am going to incorporate them into the overall scheme, and I am not sure that I care. 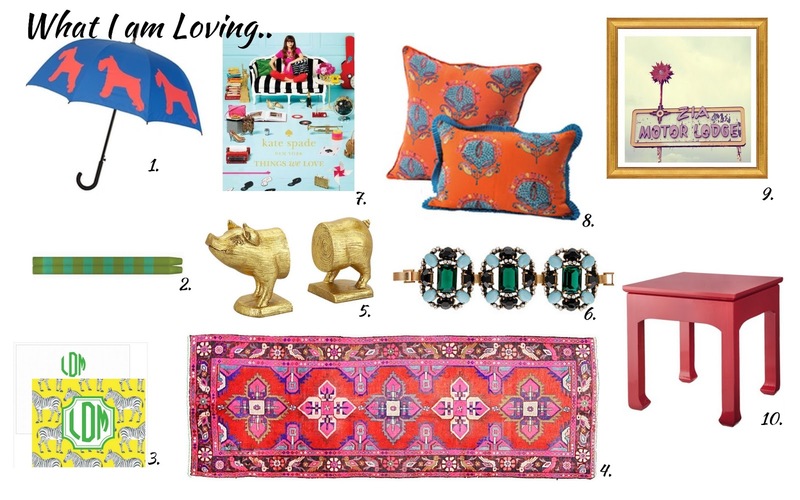 The vibrant colors and punchy pattern are just what I need to put a little pep in my step. 9. Recently I have been into the Route 66 type photography. I don't need anything that screams "Hamburgers and Shakes," so I figure this Motor Lodge photograph is just the ticket. Great color scheme. 10. Once again, Target rocking my world. How adorable is this coral Ming accent table? It is bananas is what it is. I pre-ordered the book. Love your choices. Me too!! Mine will be here next week! The Target table...I know! I love it and do not have one spot for anything coral. I wish they had a few other colors. Just love all the bright colors! Target is Bringing It!!! Those tables are to die for!!! Love it all but that runner....oh yes!! The colors are fabuloso......enjoy your weekend Lindsay! oh yes that rug!! its no longer available if that makes you feel any better. Yes you need that umbrella. I love your quirky writing ways! I've become such a fan over the last few weeks (since I first found you)! those piggy bookends have been on my radar for a while. i should probably just break down and buy them! oooh i want a doggy umbrella - too cute! also love that photograph! i had my eye on that rug too! oh please tell me you scooped it up for your house?? Did you notice the name of the sham is stella?? Clearly its destiny! Everything is delicious! Send me that runner ASAP!!! Delicious is the perfect word. Love the striped tapers, the great tulu textiles, the table... Thanks for sharing your loves.